Q: I have several custom properties I want to keep together. How can I do this? set the uProject["projectName"] of this card to "myProject"
set the uProject["swfFile"] of this card to "Animation.swf"
This will create a new property set named "uProject" with the array-like entries stored as elements of the uProject set. You have to change the custompropertyset of the object you're working with (remember to set it back to empty when you're done). set the custompropertyset of this card to "uProject"
will give you the contents of the original "project.js" file. set the projectName of this card to "myProject"
set the swfFile of this card to "Animation.swf"
You can use the IDE's Property Inspector to view and manipulate custom property sets as well. Select an object from the Project Browser and right- or control- click to bring up the contextual menu. Select the Property Inspector and go to "Custom". 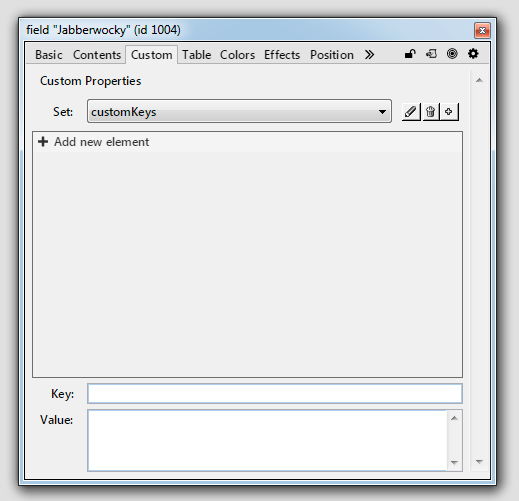 The custom properties displayed by default are from a custompropertyset named "customKeys". You can select a different set from the drop down menu of the Property Editor. 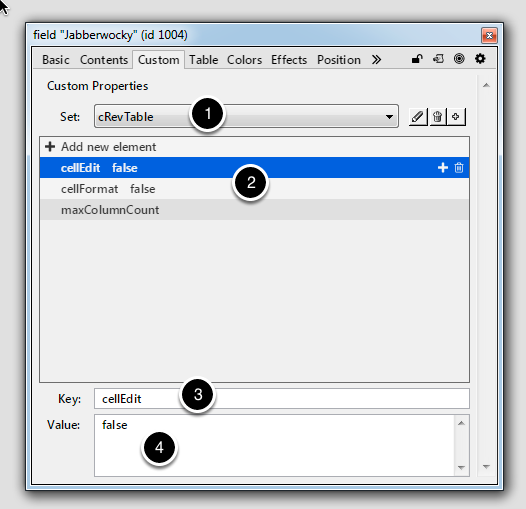 The screenshot is showing a property set belonging to the IDE. The custom set selected (1) is cRevTable. The properties in this set are shown and can be selected in the field below it (2). The current property selected is shown in the "Key" field (3), and the value of the property is shown below (4). You can't go more than one level deep in custom property sets. set the uEmployees[employeeID]["firstname"] of this stack to "Fred"
set the custompropertyset of this stack to "uEmployees"
set the employeeID["firstname"] of this stack to "Fred"
Prev: How do I define my own properties for an object? Next: How do I display an array in a table field?